Many thanks to all who attended the Quantico-Potomac Chapter 2012 USMC Information Technology Day at The Clubs at Quantico. We had a full day of valuable presentations and multiple networking opportunities. We had three general officers speak and a panel of key communications chiefs from throughout the Marine Corps operating forces. 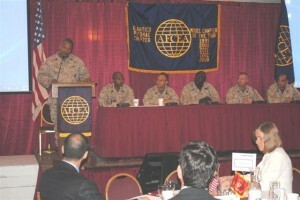 The USMC IT Day 2012 page will be updated shortly with presentations from the event. Photos from the event are also posted on that page. We were also privileged to have several science fair winning students from Stafford County visit just before lunch to be recognized for their achievements. The Chapter donated $10,000 this year to Stafford middle schools in support of their science and technology programs. The students displayed their project presentations and answered questions from IT Day attendees about their projects. We also want to thank all our sponsors! This event would not have been possible without your support. Click on this link to go to the USMC IT Day 2012 page.